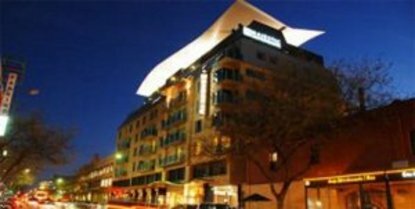 This magnificent 4.5 star hotel is situated only a stones throw from Adelaide's main business and retail districts. Offering unsurpassed views of Adelaide city and the rolling Adelaide hills. The majestic roof garden hotel features an on-site restaurant, 24-hour reception, gymnasium, and business centre and tour desk. A unique event facility is also situated on the upper most level of the hotel - and offers a variety of function seating configurations and menu alternatives as well as a unique outlook over the spectacular roof garden. As standard, each guest room provides the ultimate in creature comforts including luxurious bathrooms, individually controlled reverse cycle a/c, 68 cm large screen TV, on-demand movies, broadband internet access and direct dial telephones with personalized guest messaging service. All rooms also offer king size beds, a safe large enough for a laptop computer, full mini bar selection, tea and coffee facilities, writing desk, hairdryer and iron and ironing board.